Teen Science Café for ME! 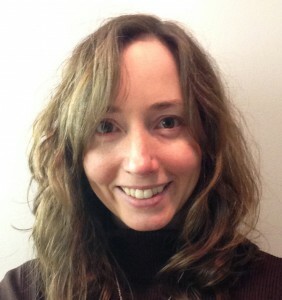 Alyson Saunders discusses her unique situation in rural Maine, how the Teen Science Café Network has helped her get started, and an all-time favorite topic . . . . Zombies! Alyson has acted as the Lead STEM guide for the Dexter-Dover Hub of the Maine Mathematics and Science Alliance since 2012, but this fall she is going back to teaching full time at Dexter Regional High School. She plans to transition the current Teen Science Café to be run via a STEM course she is teaching this coming year. What a fantastic potential model! We look forward to hearing about your experiences! In her other life, Alyson is a mom of two young boys who share her love of the outdoors and enjoy gardening, fishing, and camping as a family. To start off, please, tell us in a nutshell about your Teen Café program . . . what’s special or unique about it? Our cafe is unique in that it does not have any official physical “home”. The Maine Mathematics and Science Alliance is a non-profit STEM education organization that sponsors us (and several other TSCs around the state of Maine), but we are not based out of their office. We don’t have a large science center to call our own (actually there are none in Maine!) and we are not affiliated with a college or university. We serve multiple, very rural communities in central Maine and our teen base is less than 1,000 youth. Because of our geographic situation, we have chosen to alternate our cafes AND our youth leadership team meetings between towns to help encourage more participation and to make it fair to our youth leadership team members. Despite this challenge, we have 8 to 12 very dedicated youth (and their parents) willing to travel and be flexible. We have also made heavy use of virtual dry runs with our presenters to cut down on their travel time as well. I have worked for MMSA since 2012 and we have a project called The STEM Guides Project. TSC and it’s model fit perfectly with what we are trying to do in rural Maine – which is to connect youth to fun, informal, STEM education opportunities. We signed up (easy peasy) and I began attending the virtual “new node” trainings to help prepare myself to embark on creating our very own Teen Science Cafe for ME! program. As a former high school science teacher and outdoor educator, I had some experience working with teens in both formal and informal settings and I have found those skills useful, but not critical to running a TSC program. The TSCN has really done a great job in making sure that resources are available from the beginner to the expert! TSC has been a wonderful opportunity in many ways, for our local youth, for our program, and for me personally. By far our biggest stumbling block is scheduling meetings to accommodate 3 separate high schools from which we draw the majority of our participants. Because our pool of youth is relatively small, “everyone does everything” so we must work hard to avoid athletic events, arts events, and other large community happenings. Our youth have been very adaptable, but it IS hard on the adults who are trying to accommodate as many people as possible. Ooooh! Tough question! 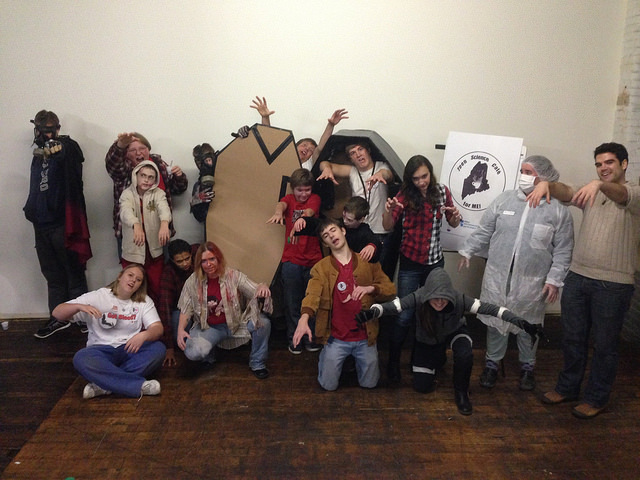 Of the 9 we have done, I think that my favorite was our “Zombies: Truth and Fiction” Café on October 30th, 2014. It was our biggest turnout, which is great, but what made it so cool was everything else! Our expert was a young, enthusiastic speaker who LOVES to talk creepy cool science and has enough background and experience to tell really great stories too. He helped to bring the topic “to life” so to speak. Our youth leadership team really took the reigns for this one also, dressing up, making creepy cool desserts, bringing and making fun decorations, and then we did a simple but effective simulated virus spreading activity with water and color changing pH indicator powder. It was a hit! The youth! We have a great youth leadership team and although they are hard to get in touch with at times, and they have very busy schedules, they are dedicated and interested in continuing with the program. They see the value in learning new things and meeting new people and they really enjoy it. So do I!